A revolutionary bench-top in situ hydrogen generating reactor, combined with an industry recognized automated liquid handler and software. The H-Cube Autosampler™ provides all the inherent benefits of the H-Cube® or the H-Cube Pro™ (safety, convenience, high throughput) integrated with an automated liquid handler made by Gilson Inc. and a dedicated control software. Now you can include hydrogenation or other heterogeneous catalytic reactions to automated synthesis. The included control software H-Sampler allows the monitoring of the entire process, including fully automated remote control of the H-Cube® or the H-Cube Pro™. The continuous flow hydrogenation with the H-Cube series allows the integration of hydrogenation or other heterogeneous catalytic reactions to automated synthesis. The Autosampler™ may be placed under a regular vented fume hood. No need for explosion-proof environment. The entire experiment can run unattended and supervised remotely. Reaction parameters are automatically set and reaction only starts when H-Cube® or the H-Cube Pro™ has fully stabilized. Reaction times take only a few minutes. Pressure and temperature can be optimized for 100% product conversion. Easy-to-use software with customizable parameters. No additional software costs or software maintenance. H-Sampler automation software supports rack and test bed customization, experiment design for library production or process optimization and full control of the liquid handler and the H-Cube Pro™. Software update and maintenance is included. Computer to be provided by Customer. The Autosampler™ makes the whole processes on the H-Cube Pro™ fully automated. 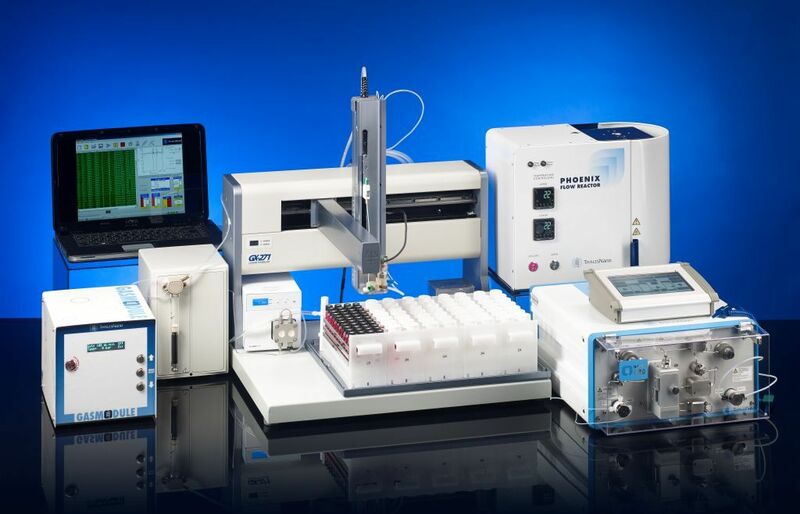 When used in conjunction with the H-Cube Pro™ and Autosampler™, it gives the possibility of the easy screening of catalysts, fast reaction optimization and compound library production to be run on a fully automated basis, as well as the simplified sample injection and fraction collection of the end product.